Woo, first entry in over 2 years! This Wednesday I saw the new Star Trek film, having seen the trailers and casting choices I had high hopes, thankfully I wasn’t disappointed. The film does its best to be a logical reboot, basically it is designed to transition from the time period (and events) of the TNG/DS9/Voyager era to the date of Kirk’s birth. It’s not a huge spoiler (since it happens in the first 5 minutes), but basically the circumstances surrounding Kirk’s birth change significantly creating a whole new Trek universe without the heavy-handed erasure that happens with most reboots. There are a few inconsistencies that can’t be explained by the reboot, like why the standard starfleet insignia is the enterprise one before the events of TOS, or why Spock is now the creator of the Kobayashi Maru test when Wrath of Kahn implies he didn’t (debatable though). The way Kirk wins it is changed too, he still cheats but the approach taken demonstrates the difference in his upbringing, and the consequences are very different. The casting is for the most part excellent, Spock and Kirk in particular. Characters like Uhura, Checkov and Sulu are fleshed out in such a way to demonstrate that they really are the best at what they do – something that never really featured heavily in TOS or the old movies. Leonard Nimoy’s appearance as Old Spock isn’t just fan service, he is fairly integral to the plot. Scotty is very much just Simon Pegg playing a stereotype. Despite being entertaining, he’s character who’s played furthest from the original. The main issue with the plot is that it basically exists as a method of justifying the reboot, if the events of the film didn’t happen there would be no reboot universe to speak of. What unfolds during the film significantly changes the balance of the Federation to the degree that future films (and even televion series) can be made without the feeling that you’re just rewatching the story you’ve already seen on TV years ago. Despite the dark events of the film, it’s very lighthearted in tone. It’s very much an entertaining (and humorous) action-adventure that doesn’t really touch on the heavy political issues and serious plotlines of the later shows. Summary: Watch it, even if you’ve never seen or don’t like previous Star Treks. Guitar Hero 2 is a little bit harder than Guitar Hero. Some things are made much easier, like descending scales (thanks to easier pull-offs) – I found myself getting 4x multipliers on solos that i’d barely pass on the original. Which probably just means I never learned to play the original properly. The songs themselves tend to be much faster and more complicated. Even the earlier songs feature some nasty solos on expert. The song choice is also a little questionable, mostly with the songs in the middle parts of the song list. The earlier and later songs are reasonably well known and are quite fun to play but the rest are quite a chore to get through, except for Sweet Child O’ Mine which is fun if a little easy. The game has a good ending though, if you’ve finally managed to nail Hangar 18 on expert you’ll find Free Bird to be an almost relaxing finale (one that happens to be about 8 minutes long). Yet again the real challenge is in the bonus songs which you have to unlock using money earned during the main game. Trogdor is a bit of fun, Thunderhorse by Dethklok (see Metalocalypse on Adult Swim) is better. Another Freezepop song Less Talk More Rokk is here and at first it seems insane but it’s actually quite easy and is a lot of fun. The hardest song in the game is supposed to be Jordan by Buckethead, something which seems quite believable. The song which I most enjoy playing is Beast and the Harlot by Avenged Sevenfold, the chorus is bouncy fun. Snakes on a Plane is the newly released (and much hyped) film from director David R. Ellis. The film follows the story of male flight attendent Ken (Bruce James) on a typical flight from Hawaii to Los Angeles. Like many male flight attendents, Ken's sexuality is in question from the start, he demonstrates a willingness to go beyond what is required of him for both male and female passengers (with perhaps a tendancy towards helping the men more than the women) and is also keen on cookery with exotic ingredients. Ken isn't persecuted by the passengers for being who he is, but the film makes you aware of their assumptions about him. A subplot brought about by FBI Agent Nelville Flynn (Samuel L Jackson) and Protected Witness Sean Jones (Nathan Phillips) provides the necessary plot elements to allow Ken to develop his character as well as some light comic–relief. So just sit back and enjoy as Ken and his fellow flight attendents Claire and Tiffany persue romance and acceptance in this fateful flight across the Pacific. An excellent film that provides entertainment and intelligent dialog for all viewers. Some stuff happened in this film, mostly involving people getting killed with unfortunate uses of the colour "yellow" towards the end. Enjoyable enough to watch but I can't help but think it's a little overrated. More vampires with swords, what more is necessary? Nothing, that's what. Awesome fun. It's like Final Fantasy VII, but even more crazy. Not as deep as the game, but features awesome action scenes and music from both the game and covers by Nobuo Uematsu's own band The Black Mages. Much love for this. Film of the year. Fact. There's nothing like Joss Whedon's complete disregard for the lives of his characters to add some genuine suspense to a film. Also, Kayleeeeeeeeeee (River and Inara too). More actiony than the series but just as witty and bantery (new words galore?). New Discworld book, awesomes. This is the good stuff, it's another Vimes/Watch novel, mostly Vimes-oriented, continues the darker tones of recent City Watch books. Stratovarius are credited with making Finnish metal popular, it's likely that without them the likes of Sonata Arctica and Nightwish wouldn't be the same. Over the last couple of years the band basically imploded with the singer (Timo Kotipelto) being kicked out of the band by the guitarist (Timo Tolkki), them getting a new female singer, then Timo Tolkki had some severe depression things and the band looked dead. Then magic happened with Timo and Timo making up and now the band which also features an amazing keyboard player (Jens Johansson – this guy is incredible) is back together and have produced a self-titled album. The album loosely follows the story of the band over the past couple of years (the track order is a big clue) and appears to show a new direction for the band. The sound is now fuller and better produced and the new direction makes it possible to compete with Sonata Arctica and Nightwish who have overtaken them in popularity. This isn't an album where every song is a masterpiece, but they all fit together and there are a few songs that rate amongst their best (Fight!!! The Land Of Ice And Snow, United) and if this is a true indication of their musical direction they might be in for a big comeback. There's a good mix of heavy, weird, mellow and uplifting tracks so there should be something that appeals to most people. Disappointing game with an improvement towards the end. I bought it a couple of weeks ago for £15. I played it up until a gun was attached to my airboat at which point I exclaimed "more airboat-boring-stuff?!" and went to play Final Fantasy 10 (awesome) for about a week and a half (Final Fantasy 10 is so awesome, except the music, it has some good music but the last great Final Fantasy soundtrack was on Final Fantasy 8. The game is nice and easy to play, but to complete 100% it's so bloody hard, harder than any other game). Having reached the stage of Final Fantasy 10 where I wanted a bit of a change from levelling up to fight the Dark Aeons I decided to return to Half-Life 2. I managed to force my way through the rest of the airboat level, the dire predictability of ravenholm (here's a clue, if you want a scary level go play the Ocean Front Hotel in Vampire The Masquerade: Bloodlines, you know, the good game on the Source engine) and even more boringness with the excessively long drive along the highway to the prison. The prison was fun for a while, until it kept going on and on and on and on. Then you got warped back to City 17 were things improved a little. Lots of shooting things that weren't headcrabs or zombies and other stuff like that. Then you met up with Barney (remember Barney? you killed him dozens of times in the first Half-Life whilst waiting for the game to happen. Well apparantly he survived and is somehow now the most competent person in the city – I think I figured out how things got so bad) and blew up some monsters from War of the Worlds, Tom Cruise should sue. Then the game got good. You went inside a magical citadel of verticalness (did you know that the reason that Jedi Knight is the greatest first-person shooter of all time is that it mastered use of the third dimension?) and didn't have to do much at all except lose all your weapons and bounce people around with your super-powered Gravity Gun, then you got to shoot magic marbles around which vapourised people (but not you, you're immune to magic marbles, quite lucky really). You got to have fun for about 30 minutes, during which the entire game's worth of story was played out. Then the game finished with an ending that was so cheeky it was positively brilliant. I think i'm starting to remember why I stopped playing first-person shooters a couple of years ago. Back to guitaring. I bought this album because a few people said DragonForce was sweet, I absolutely did not download one of the tracks to give them a listen first. Really. People were right, this album is sweeet. There are only 8 tracks, but they're all between 5 and 10 minutes so it's worth it. Some tracks are all out speed metal, others focus on power, and my particular favourite "Dawn Over A New World" is slower but is realllly awesome. I really need to buy their debut album now. I also need to up my picking speed by 30–40 bpm so I can play along without killing myself. 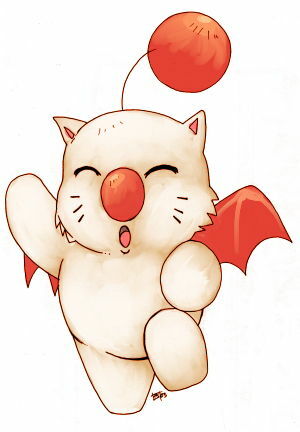 Here is a Moogle, a fluffy cat-like thing that can fly, like a dragon.